Momcilo Moma Aleksandric is a Serbian guitarist pursuing a doctoral degree in guitar performance at the University of Minnesota under the mentorship of professor Maja Radovanlija. 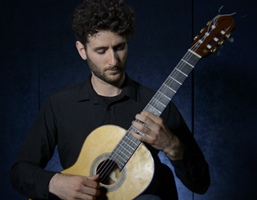 He is interested in guitar performance, education, research, interdisciplinary collaborations, as well as artistic events organization the goal of which is to develop an understanding of classical guitar and reach to a wider audience. As a creator, co-founder and CEO of Belgrade Guitar District, he successfully organized three concert seasons in Belgrade (2015-2017), as well as performance and educational video recordings for their YouTube channel. He is a winner of many competitions in Serbia, among them Guitar Art Festival (Belgrade), National Competition (Belgrade), Guitar Open Festival (Subotica), Naissus Guitar Festival (Nis) and VArt Guitar Festival (Valjevo). As a soloist and a member of Belgrade Guitar Duo he performed in all major concert halls in Serbia. He has participated in several interdisciplinary projects and groups funded by the Institute for Advanced Study, such as Improvising Ecosystems (2016-2017), and 5×5 interdisciplinary group Forms and Transmutations (2017) together with prominent professors from the University of Minnesota. In 2017 he presented his research Construction of a Dream in Benjamin Britten’s Nocturnal for Guitar at humanitiesNOW Conference at the University of Cincinnati, and Llobet’s Hommage to Sor at the University of Indianapolis. He is a teaching assistant at the University of Minnesota.